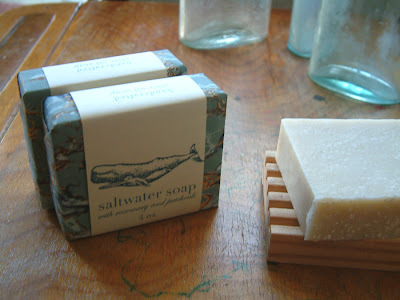 Here is the Saltwater soap, back in effect after a seasonal hiatus. Salt crystals give it a roughness in the shower which lots of you like and the strong camphor scent (rosemary with a hint of patchouli) is oddly reminiscent of the sea. Granted, not the sea round these parts.